Custom is a general title for specifically adapted laser treatments which can be carried out with LASIK and PRK method. Standard treatments remove diopter and method of diopter removal (laser diopter removal on the cornea) is completely identical for each patient. In custom (adapted) treatments, diopter removal is different for each eye as the software program takes into consideration the irregularities of corneal micro irregularities or optical imperfection of the whole eye and it corrects it together with the diopter for the purpose of improvement of postoperative vision quality. Custom LASIK/PRK is based on unique characteristic of your eye. Generally, each eye has a series of unique optical irregularities called higher order abberations which can be compared with the fingerprint. Those irregularities cause disturbances as decreased contrast sensitivity or poor night vision, glare, halos and starbursts. Custom or advanced LASIK/PRK reduces or eliminates this kind of irregularities in the eye which makes the intervention personalized and individualized for each patient, and this is achieved with the help of wavefront technology that captures three-dimensional image of the eye. 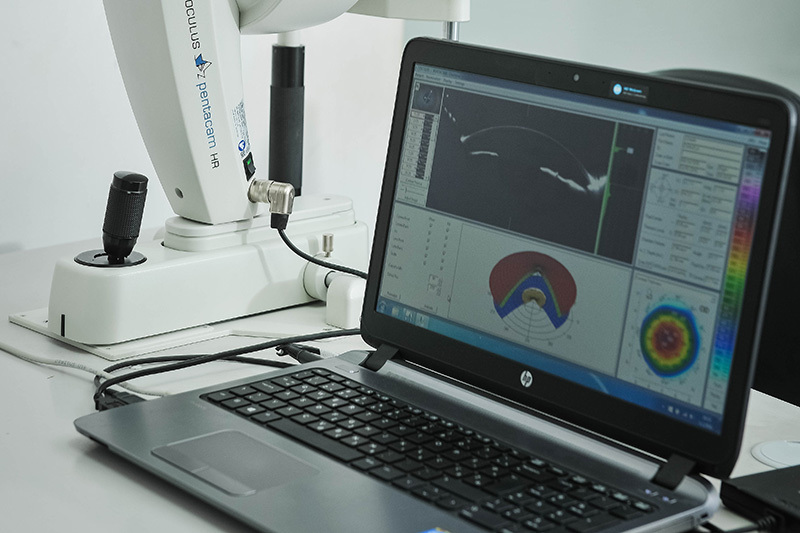 The resulting measurements are displayed as a map; they are automatically entered in the laser so the vision correction is made according to the individual optical system of each eye by correcting documented irregularities. Using this method, sharp vision is achieved that is sometimes impossible to correct with the standard LASIK, PRK, and by wearing glasses or contact lenses that correct only the diopter (diopter is one of the lower-order aberrations). "How far" the patient sees depends on the lower-order aberrations that standard LASIK can treat. But "how well" the patient sees depends on the presence of type and number of visual disorders or higher-order aberrations. Custom LASIK/PRK treats both aberrations of higher and lower order. Custom treatments have a special name (brand names) in each company. The company AMO such treatments call CustomVue, and the company Alcon topo link (topography guided) or ocular link(ocular wavefront guided). In case of Schwind laser, we have a possibility to choose between removing only the irregularity of the cornea (the transparent front part of the eye), or of the entire eye (corneal wavefront guided and ocular wavefront guided). Which of Custom treatments is better for each patient depends on his eye status (eg. in case of corneal scars, corneal guided is usually used which, other than diopter, corrects also the scar, and in patients with night vision disturbances that are not caused by retinal diseases, ocular guided is usually used). Standard treatments (which correct only diopter) are good for most people because healthy eyes have very little aberrations, but in the event of any further disturbances, additional removing of so-called higher order aberrations enables a better vision.